Since the identification of the p38 mitogen-activated protein kinase (MAPK) as a key signal-transducing molecule in the expression of the proinflammatory cytokine tumor necrosis factor (TNF) more than 10 years ago, huge efforts have been made to develop inhibitors of p38 MAPK with the intent to modulate unwanted TNF activity in diseases such as autoimmune diseases or sepsis. However, despite some anti-inflammatory effects in animal models, no p38 MAPK inhibitor has yet demonstrated clinical efficacy in human autoimmune disorders. One possible reason for this paradox might relate to the fact that the p38 MAPK signaling cascade is involved in the functional regulation of several different cell types that all contribute to the complex pathogenesis of human autoimmune diseases. In particular, p38 MAPK has a multifaceted role in CD4 T cells that have been implicated in initiating and driving sustained inflammation in autoimmune diseases, such as rheumatoid arthritis or systemic vasculitis. 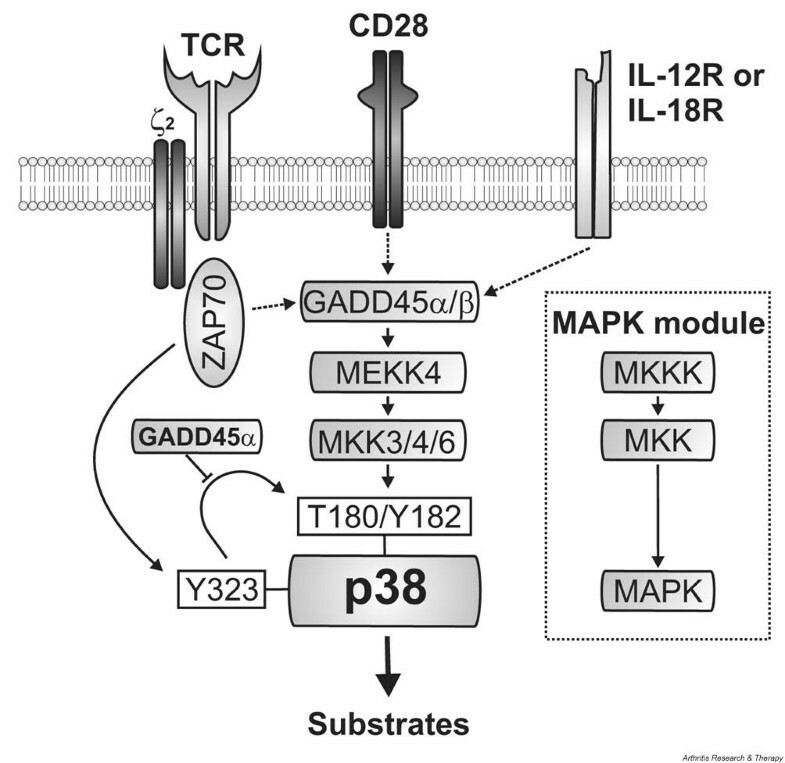 Here we review recent advances in the understanding of the role of the p38 MAPK signaling cascade in CD4 T cells and the consequences that its inhibition provokes in T cell functions in vitro and in vivo. These new data suggest that p38 MAPK inhibitors may elicit several unwanted effects in human autoimmune diseases but may be useful for the treatment of allergic disorders. The mitogen-activated protein kinase (MAPK) family comprises at least four groups, namely p38, extracellular signal-related kinases 1 and 2 (ERK1 and ERK2), Jun amino-terminal kinases (JNKs), and ERK5. Within this family, the p38 MAPK was characterized in 1994 by Han et al. as a protein kinase that was tyrosine phosphorylated in mammalian cells in response to lipopolysaccharide (LPS) and extracellular changes in osmolarity, linking the p38 MAPK signaling pathway to stress-induced responses . The p38 MAPK became an interesting therapeutic target in inflammatory diseases because in the same year Lee et al. showed that the p38 MAPK has a pivotal role in mediating tumor necrosis factor (TNF) production by macrophages in response to stimulation with LPS. Since then, many different inhibitors have been developed that have greatly facilitated the definition of the role of p38 MAPK in many biologic systems. By using these inhibitors in combination with transgenic mice expressing constitutively active or inactive forms of p38 MAPK, p38 MAPK was shown to be involved in many cellular responses in mammalian cells including cell cycle regulation , cell death , cell development, and cell differentiation . In the immune system, the p38 MAPK signaling cascade has been implicated in the regulation of innate immunity, for example by mediating endotoxin-induced TNF expression, and also in the regulation of adaptive immunity, for example by controlling T cell activation and differentiation . Antigen-presenting cells (APCs) activate CD4 T cells by presenting their specific antigen in the context of appropriate major histocompatibility complex (MHC) class II molecules. The antigen is recognized by T cells by means of their antigen-specific T cell receptor (TCR). In addition to the MHC-TCR contact, APCs and T cells communicate through co-stimulatory molecules, such as CD80 and CD86 expressed by APCs and their ligand, CD28 expressed by T cells, and through cytokines. Once activated, CD4 T cells proliferate and differentiate into two main subsets of primary effector cells, T helper type 1 (Th1) or Th2 cells, characterized by their specific cytokine expression pattern . Th1 cells promote cellular immunity and macrophage activation largely through the production of their signature proinflammatory cytokine IFN-γ. They control immune responses against microbial infections and intracellular parasites and are involved in the development of autoimmune inflammatory diseases such as rheumatoid arthritis [7, 8]. Th2 cells, through the expression of IL-4, IL-5, and IL-13, induce IgE production by B cells and eosinophil-mediated and mast-cell-mediated immune responses, and orchestrate the defense against extracellular parasites . Th2 cells have a central role in driving the immune response in asthma and atopic diseases . In addition, Th2 cells, through the production of IL-4, downmodulate Th1 differentiation and macrophage activation and may have regulatory capacities for Th1-mediated inflammation . The Th1/Th2 balance is therefore considered to be pivotal in chronic inflammatory diseases, such as rheumatoid arthritis, in which excessive Th1 inflammation may be a consequence of impaired Th2 differentiation . The nature of a T cell response, namely a Th1 or Th2 response, is modulated by the strength of the MHC-TCR contact, the nature of the co-stimulatory signals, and the nature of the cytokine environment during T cell priming . Integration of these different extracellular signals within T cells is accomplished by several signaling cascades, including the p38 MAPK pathway. Indeed, disruption of the p38 MAPK signaling cascade can affect T cell differentiation as well as T cell effector functions. In addition to T cells, macrophages also have an essential role in autoimmune disorders, for example through the production of the proinflammatory cytokines TNF and IL-1. Because the p38 MAPK signaling cascade has been implicated in TNF expression, p38 MAPK is considered to be a potential therapeutic target for inflammatory disorders such as autoimmune diseases, and several p38 MAPK inhibitors are currently in clinical trials. However, because T cells and macrophages both are involved in autoimmune inflammation and because the function of both is regulated by the p38 MAPK signaling cascade, understanding the function of p38 MAPK in human T cells may be extremely valuable with regard to clinical applications of p38 MAPK inhibitors. Four p38 MAPK isoforms have been characterized, namely p38α, p38β, p38γ, and p38δ, which have in common a 12-amino-acid activation loop containing a TGY motif located at amino acid position 180 to 182. CD4 T cells predominantly express the p38α and p38δ isoforms . Activation of p38 MAPK occurs by the phosphorylation of Thr180 and Tyr182, leading to conformational reorganization of the enzyme and binding of ATP and the phosphoryl acceptor (substrate). Two different sequential binding mechanisms for ATP and the substrate have been proposed [15, 16], although the order in which ATP and the phosphoryl acceptor bind may occur randomly and may depend on the phosphoryl acceptor . The rate-limiting step in the kinetic mechanism of p38 MAPK activation is still unknown but may be of great importance in designing new inhibitors of p38. More than 100 different p38 MAPK inhibitors have been reported so far, and all are competitive with ATP. However, and in contrast to ATP, these compounds can bind to both the active and inactive (unphosphorylated) forms of p38, providing an advantage over ATP and resulting in a very potent inhibitory capacity, regardless of high intracellular ATP concentrations . Since the first generation of p38 MAPK inhibitors, like the pyridinyl imidazole compound SB203580, which have been shown to affect several unrelated kinases, the understanding of the kinome has greatly improved and has facilitated the development of more selective inhibitors . These new molecules have now helped to clarify the role of p38 MAPK in vitro and to define the mechanisms by which p38 MAPK controls for example LPS-induced cytokine expression in macrophages . The MAPK pathway is similar for all the members of the MAPK family and is typically composed of a highly conserved MAPK module comprising three kinases, namely MAPK kinase kinase (MKKK), MAPK kinase (MKK), and MAPK  (Fig. 1). In the p38 MAPK cascade, MEKK4 (an MKKK) activates MKK3, MKK4, or MKK6, which subsequently phosphorylate p38 MAPK at Thr180 and Tyr182 [21, 22] (Fig. 1). The mechanisms regulating the activation of the MAPK module are very complex, in particular in T cells in which the TCR and CD28 act synergistically to induce intracellular cell signaling. The p38 mitogen-activated protein kinase (MAPK) signaling cascade in T cells. Activation of p38 MAPK requires dual phosphorylation at Thr180 (T180) and Tyr182 (Y182) and can be mediated by two different pathways in T cells. The classical pathway is formed by a conserved MAPK module and is activated by the T cell receptor (TCR), CD28, or the IL-12/IL-18 receptors through growth arrest and DNA damage-inducible genes (GADD)45α or GADD45β. The alternative pathway is activated by the TCR and induces the phosphorylation of p38 MAPK at Tyr323 (Y323) and subsequent autophosphorylation of p38 MAPK at Thr180 and Tyr182 that can be blocked by GADD45α. MKK, MAPK kinase; ζ2, zeta chain homodimer. One critical event after stimulation of the TCR that is essential for activation of the MAPK signal cascade is the recruitment of linker for activation of T cells (LAT) and the activation of guanine nucleotide exchange factors (GEFs). GEFs activate small GTP-binding proteins such as Ras, Rac-1, and Cdc42 by promoting the conversion of the GDP-bound inactive state to the GTP-bound active state, leading to the activation of the MAPK signaling cascade. Activation of the p38 MAPK cascade in Jurkat T cells has been shown to require phosphorylation of the GEF Vav by Zap-70 and subsequent activation of Rac-1. CD28 co-stimulation augments the recruitment of Vav to LAT and Zap-70 and increases Zap-70 mediated Vav phosphorylation . Rac-1 elicits the p38 MAPK cascade through the p21-activated kinase 1 (Pak1), although the exact mechanism remains unclear because Pak1 does not directly activate an MKKK . Direct upstream activators of MKKKs are the growth arrest and DNA damage-inducible genes 45 (GADD45) proteins, which are important in the regulation of p38 MAPK activity in T cells [25, 26]. GADD45 proteins can bind the autoinhibitory domain of MEKK4 (MKKK), which is an upstream activator of p38 MAPK and JNK, and relieve the autoinhibition of MEKK4, leading to activation of the MAPK cascade . Whether GADD45 proteins are activated by Pak1 remains to be elucidated. Interestingly, the activation of p38 MAPK by cytokines seems to occur in two phases that can be regulated by two different mechanisms: a rapid but brief GADD45β-independent activation followed by a delayed but sustained GADD45β-dependent activation [28, 29]. Although data on the role and mode of activation of GADD45 proteins in T cells are still controversial, the regulation of the expression levels of GADD45 proteins constitutes an indirect additional mechanism to control the intensity and duration of p38 MAPK activation. An alternative pathway for p38 MAPK activation in T cells has been recently described in which dual phosphorylation of Thr180 and Tyr182 is not induced by an MKK but by p38 MAPK itself. Stimulation of the TCR induces phosphorylation of p38 MAPK on Tyr323 through Zap70, which subsequently leads to autophosphorylation of Thr180 and Tyr182 . It has been suggested that in T cells, the classical pathway in which GADD45 proteins activate MEKK4 might be induced predominantly by stress signals, whereas the alternative pathway might be activated by TCR stimulation . 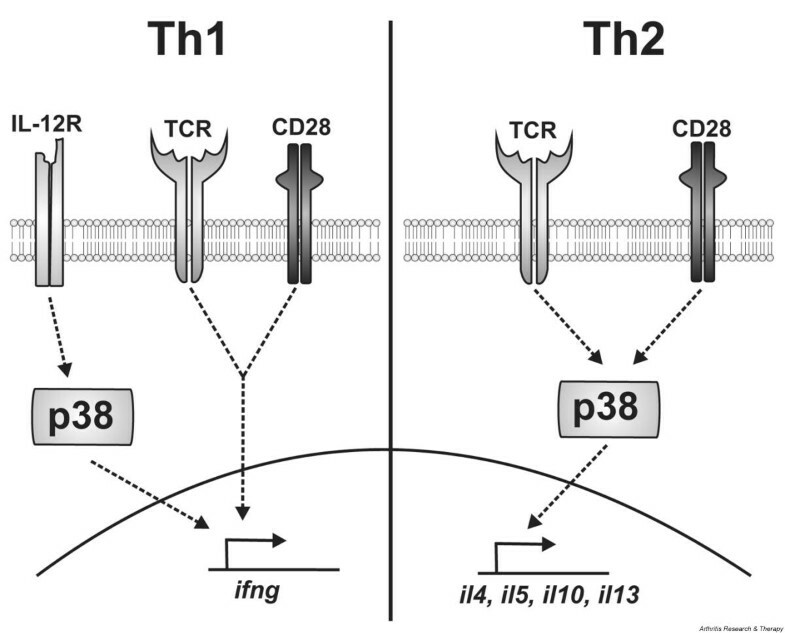 However, p38 MAPK phosphorylation induced by TCR ligation is impaired in GADD45β-deficient naive T cells , indicating that both the classical pathway and the alternative pathway are required for p38 MAPK activation in T cells (Fig. 1). The level of protein phosphorylation is controlled by the coordinated activities of kinases and phosphatases. Dephosphorylation of either Thr180 and Tyr182 is sufficient to inactivate p38 MAPK and can be mediated by tyrosine-specific MAPK phosphatases (TS-MKPs) such as phospho-tyrosine phosphatase SL (PTP-SL), serine/threonine-specific MKPs (SS-MKPs) such as protein phosphatase type 2A (PP2A), or tyrosine and threonine dual-specificity phosphatases (DS-MKPs) such as MKP1. The MAPK cascade can induce phosphatase gene transcription, providing a negative feedback for MAPK activation . Another mechanism of inactivation of p38 MAPK is mediated by GADD45α, which has recently been shown to inhibit the activation of p38 MAPK by the alternative pathway, but not by the classical pathway, in T cells but not in B cells  (Fig. 1). Similarly, GADD45β can inhibit the JNK pathway by binding one of its upstream activators, MKK7 . These observations are intriguing because GADD45 proteins are, as mentioned above, also activators of the MAPK signaling cascade and therefore seem to be important in regulating p38 MAPK activity by exerting both activating and inactivating effects. All the MAPKs phosphorylate a threonine or a tyrosine, which is immediately followed by a proline residue. This 'P + 1' sequence is the most reliable consensus motif for MAPK substrates . The specificity of the different members of the MAPK family and of the different isoforms of p38 MAPK is provided by a docking motif usually composed of three domains: the basic region, the LXL motif, and the hydrophobic region. The hydrophobic region seems to be of particular importance for the determination of the substrate specificity for p38 MAPK . The development of models to predict p38 MAPK docking-domain specificities may permit the design of inhibitory peptides to block the phosphorylation of specific subsets of substrates so as to block specific pathways mediated by p38 MAPK . p38 MAPK substrates can be divided into two categories, namely transcription factors and protein kinases (Table 1). Several of the protein kinases activated by p38 MAPK are involved in the control of gene expression at different levels. Mitogen- and stress-activated kinase 1 and 2 (MSK1/2), for example, can directly activate transcription factors such as cAMP-response element-binding protein (CREB), activating transcription factor 1 (ATF1), NF-κB p65, signal transducers and activators of transcription (STAT1), and STAT3 [38–41], but can also phosphorylate the nucleosomal proteins histone H3 and high-mobility-group 14 (HMG-14). Either by inducing chromatin remodeling or by recruiting the transcriptional machinery, these two proteins are important for the rapid induction of immediate-early genes that occurs in response to stress or mitogenic stimuli . In contrast to MSK1/2, which preferentially activates transcription, MAP kinase-activated protein kinase 2 (MK2) participates in the control of gene expression at the post-transcriptional level by phosphorylating tristetraprolin (TTP) or heat shock protein 27 (hsp27) . Environmental stress such as osmotic shock activates p38 MAPK in almost every mammalian cell. A variety of other stimuli, such as cell-cell contact or soluble factors such as cytokines, are also able to activate p38. In T cells, the p38 MAPK is activated by contact with APCs or by different cytokines. Triggering of the TCR alone leads to activation of the p38 MAPK pathway in naive and memory CD4 T cells. However, several reports have demonstrated that full activation of p38 MAPK in vitro requires co-stimulation in addition to TCR stimulation. The co-stimulatory molecules CD28, 4-1BB, CD26, CD30, inducible co-stimulator (ICOS), and erythropoietin-producing hepatocyte B6 (EphB6) have been shown to activate p38 MAPK synergistically with TCR stimulation [44–50]. Interestingly, ligation of CD30, CD28, or EphB6 also activates p38 MAPK in the absence of TCR ligation [46, 47, 49, 51]. However, the requirement for p38 MAPK activation with regard to co-stimulatory receptor ligation differs between T cell subsets. Whereas the p38 MAPK pathway can be activated by CD28 stimulation alone in memory CD4 T cells, naive T cells strictly require concomitant TCR signaling , indicating that naive T cells are lacking an important molecule necessary to link the CD28 signaling to the p38 MAPK signaling cascade. This deficiency might contribute to the higher activation threshold of naive T cells than that of memory T cells. In addition to co-stimulatory molecules, some cytokine receptors can activate p38 MAPK in T cells. The IL-12 receptor, for example, has been shown to signal by means of the p38 MAPK cascade in activated T cells. However, activation of p38 MAPK by IL-12 alone is only transient (less than 20 minutes) . Sustained activation of p38 MAPK can be observed by simultaneous stimulation with IL-12 and IL-18 and requires the expression of GADD45β . Whether IL-12/IL-18 directly activates GADD45β or simply induces its expression remains a matter of debate [26, 28]. IL-4 and IL-2 have been shown to induce p38 MAPK activation in the murine T cell line CT6 but not in primary T cells [51, 53, 54]. In our hands, IL-4 was unable to activate p38 MAPK in primary naive and memory human CD4 T cells (F Dodeller, A Skapenko, H Schulze-Koops, unpublished data). This could be related to the relatively low expression of the IL-4 receptor in primary cells in comparison with the murine cell line, but also to differences in the signaling pathway of IL-4 in primary human T cells and T cell lines . Interestingly, p38 MAPK has been implicated in IL-4 receptor signaling in human airway smooth muscle cells  and in murine B cells . Because of the critical role of IFN-γ in inflammation, the delineation of the molecular mechanisms controlling the expression of IFN-γ has been the focus of many studies. IFN-γ expression can be induced in CD4 T cells either by antigen-specific stimulation or by co-stimulation with IL-12 and IL-18. Although both stimuli activate p38 MAPK and IFN-γ production, it remains controversial whether antigen stimulation signals through p38 MAPK to induce IFN-γ expression. Two different reports have demonstrated that inhibition of p38 MAPK in Th1 cells differentiated in vitro decreased IFN-γ expression induced by IL-12/IL-18 stimulation, but not that induced by antigen stimulation [57, 58]. In contrast, inhibition of p38 MAPK in splenic T cells decreased IFN-γ expression induced by CD3 and CD3/CD28 stimulation . Similarly, Flavell et al. have shown that the expression of a dominant-negative mutant of p38 MAPK or a constitutive active mutant of p38 MAPK in murine Th1 effector cells resulted in decreased or increased IFN-γ expression, respectively . However, because those Th1 cells were differentiated in vitro by the addition of IL-12 before antigen re-stimulation, it is not completely resolved whether the inactive or active mutants of p38 MAPK affected only Th1 differentiation induced by IL-12 or modulated IFN-γ expression induced by antigen stimulation. Similarly to the situation in the mouse, in human T cells p38 MAPK seems to preferentially modulate IFN-γ expression that is induced by IL-12 rather than that induced by TCR stimulation (Fig. 2) . We have recently shown that although p38 MAPK does not control IFN-γ expression induced by TCR and CD28 stimulation in human T cells, a moderate and transient reduction of IFN-γ expression occurred after inhibition of p38 MAPK in the presence of IL-12, indicating that the p38 MAPK pathway is involved in mediating IL-12-induced IFN-γ expression . Interestingly, whereas IFN-γ expression induced by TCR/CD28 stimulation seems to be independent of p38, that induced by stimulation by means of the TCR and the co-stimulatory receptor CD26 (A6H antigen) was decreased in the presence of a p38 MAPK inhibitor , suggesting that different co-stimulatory molecules might induce IFN-γ expression through the p38 MAPK pathway. The role of p38 mitogen-activated protein kinase (MAPK) in human T cell effector functions. The activation of p38 MAPK in T cells downstream of the T cell receptor and CD28 is necessary for the expression of IL-10 and of the T helper type 2 (Th2) cytokines IL-4, IL-5, and IL-10, but not for that of the Th1 cytokine IFN-γ. In Th1 cells, however, p38 MAPK is involved in the expression of IL-12-induced IFN-γ production. In marked contrast to myeloid cells, in which the p38 MAPK pathway is the main pathway involved in the expression of the proinflammatory cytokine TNF, p38 MAPK activation is not required for TNF expression in T cells [60, 61], emphasizing that the function of p38 MAPK is cell type specific. Inhibition of the p38 MAPK signaling cascade downregulates IL-2 promoter activity and IL-2 production in Jurkat T cells . In primary T cells, however, although inhibition of p38 MAPK modulated IL-2 promoter activity , it did not reduce but could in some cases even increase the expression of IL-2 [60, 63–65]. Interestingly, the inhibitory effect of p38 MAPK on IL-2 expression could be shown to be a consequence of the inhibition of ERK activity . The role of p38 MAPK in IL-4, IL-5, and IL-13 expression depends on the nature of both the stimulus and the cells involved. Whereas the expression of IL-4 and IL-5 induced by stimulation of in vitro-differentiated murine Th2 cells with concanavalin A remained unaffected by the chemical inhibitor of p38 SB203580 or a dominant-negative mutant of p38, the induction of IL-4 by phorbol 12-myristate 13-acetate and ionomycin or of IL-5 and IL-13 by phorbol 12-myristate 13-acetate and dibutyryl cAMP was partly abrogated by SB203580 [59, 66]. In murine splenic T cells, CD3-induced and CD3/CD28-induced IL-4 expression as well as CD30-induced IL-13 expression were also partly abrogated by SB203580 [44, 46, 67]. In human CD4 T cells, inhibition of p38 MAPK by SB203580 or by a dominant-negative mutant of p38 MAPK reduced the expression of IL-4, IL-5, and IL-13 in response to CD3 and/or CD28 stimulation [60, 61], indicating that the p38 MAPK pathway has a critical role in the regulation of Th2 cytokine expression in primary human T cells (Fig. 2). In contrast, the production of IL-4, IL-5, and IL-13 by in vitro-activated established human Th2 effector cells was only moderately affected by p38 MAPK inhibition, suggesting that additional pathways mediate the expression of these cytokines in effector Th2 cells in comparison with primary T cells . In line with this observation, the inhibition of p38 MAPK in Th2 cell clones derived from atopic asthmatic patients partly inhibited the expression of IL-5 but did not alter that of IL-4 . Together, these data clearly indicate that the role of p38 MAPK in Th2 cytokine expression is different in primary T cells and established effector cells and is therefore dependent on the stage of T cell maturation. Early studies indicated that p38 MAPK regulates IL-10 expression in monocytes . In murine and human T cells, inhibition of p38 MAPK by SB203580 or a dominant-negative mutant of p38 MAPK strongly diminished IL-10 expression [60, 63, 64, 67]. In human CD4 T cells as well as in anergic murine T cells, inhibition of p38 MAPK resulted in diminished production of IL-10 [60, 63, 64]. Because IL-2 and IL-10 are proinflammatory and anti-inflammatory cytokines, respectively, it has been postulated that p38 MAPK might therefore have a pivotal role in the maintenance of T cell unresponsiveness in anergic T cells . The nuclear factor of activated T cells (NFAT) family of transcription factors has a critical role in T cell effector functions, and NFAT DNA-binding sites have been identified in many different cytokine genes, for example those of IL-2, IL-4, and IFN-γ [70–72]. p38 MAPK can positively and negatively modulate NFAT activity by several mechanisms. p38 MAPK can induce NFAT expression at the transcriptional and post-transcriptional levels and can promote the interaction of NFAT with the coactivator CREB-binding protein (CBP). In contrast, p38 MAPK can inhibit NFAT transcriptional activity by phosphorylation of NFAT and by activation of NFAT nuclear export [73, 74]. An alternative transcription factor that is regulated by p38 MAPK is the Th2-specific transcription factor GATA-3 . Intensive investigations have demonstrated the fundamental function of GATA-3 in Th2 immune regulation and have shown that GATA-3 can directly activate the IL-5 and IL-13 promoters and induce chromatin remodeling at the il4 locus. However, the molecular mechanisms that regulate GATA-3 activity are unclear. One report has claimed that phosphorylation of GATA-3 occurs in Th2 cells and that this phosphorylation was mediated by p38 MAPK . The transcription factor C/EBPβ is a direct substrate of p38. Interestingly, C/EBPβ can bind to the IL-4 promoter, and retroviral overexpression of C/EBPβ in thymoma cells induced IL-4 gene expression and decreased IFN-γ and IL-2 mRNA levels . STAT transcription factors mediate the induction of gene expression downstream of cytokine receptors and therefore have an essential role in the immune response. After ligand binding, STAT proteins are recruited to the cytokine receptors and phosphorylated on tyrosine residues by Janus tyrosine kinases (Jaks) . Interestingly, in addition to tyrosine phosphorylation, STAT proteins in vertebrates can also be phosphorylated at a serine residue . Stimulation by IL-12, for example, induces STAT4 phosphorylation at both tyrosine and serine residues. Serine phosphorylation is required for full activation of STAT4-induced transcription and IFN-γ expression and it has been shown that this essential phosphorylation step is mediated by p38 MAPK [78, 79]. The p38 MAPK signaling pathway has also been implicated in IL-12-induced IFN-γ expression in a STAT4-independent pathway , probably by means of the transcription factor ATF2 . In macrophages, the induction of IL-10 expression by LPS requires activation of the p38 MAPK pathway. In these cells, the inhibition of p38 MAPK affects the activity of the IL-10 promoter by inhibiting binding of the transcription factor Sp1 . Whether p38 MAPK controls IL-10 expression through Sp1 in T cells remains to be shown. The transcription factor CREB can be activated by the calcium/calmodulin-dependent protein kinase IV (CaMKIV)  and by the p38 MAPK pathway by means of MK2 or MSK1/2 [40, 83]. Studies of the role of CREB in T cells have provided conflicting results with regard to whether CREB is a positive or negative regulator of cytokine transcription. Reduction of CREB expression by using short interfering RNA or neutralization of CREB with an intracellular antibody in T cells decreased IFN-γ expression induced by activated macrophages . Similarly, CD4 T cells expressing a dominant-negative mutant of CREB showed defective expression of IL-2, IL-4, and IFN-γ. However, this defect was secondary to the inability of these cells to express the inhibitor of programmed cell death, Bcl-2, leading to impaired T cell differentiation . In CaMKIV-deficient mice, whereas naive T cells did not express any apparent defect in cytokine expression, the expression of IL-2, IL-4, and IFN-γ was decreased in a subpopulation of CD4 T cells with a memory phenotype. This defect reflected the incapacity of these cells to activate CREB and the expression of the CREB-dependent immediate-early genes c-jun, fosB, fra2, and junB that are necessary for cytokine gene expression . In contrast, overexpression of CREB in Jurkat T cells has been shown to downmodulate IFN-γ promoter activity directly . These data suggest that CREB may have a dual role in cytokine expression in CD4 T cells by directly blocking the IFN-γ promoter and by indirectly regulating T cell differentiation or cytokine gene transcription factors. However, the role of p38 MAPK with regard to CREB function in T cells remains to be elucidated. Another mechanism by which p38 MAPK may modulate cytokine gene transcription in T cells may be through the regulation of gene accessibility. Indeed, histone phosphory-lation, as well as acetylation or methylation, locally affects the chromatin structure and subsequently gene expression. The p38 MAPK cascade can induce the phosphorylation of, for example, the histone H3 by means of MSK1 . In dendritic cells, phosphorylation of histone H3 by the p38 MAPK signalling pathway was necessary for the expression of IL-8 and MCP-1 in response to stimulation with LPS. Phosphory-lation of H3 enhanced the accessibility of these genes, leading to recruitment of NF-κB and induction of gene transcription . Whether a similar mechanism occurs in T cells is currently unknown. Regulation of mRNA turnover is an important mechanism in the control of gene expression. mRNA stability is mediated by AU-rich sequences present in the 3' untranslated region. These AU-rich elements (AREs) are involved in mRNA stabilization or destabilization by means of specific RNA-binding proteins. AREs are present on many cytokine mRNAs and are required for p38-mediated mRNA stability . The p38 MAPK pathway has been shown to affect the mRNA stability of proinflammatory genes, mainly that of mRNA for cytokines such as IL-2, IL-3, IL-6, IL-8, TNF, and GM-CSF [90–92] but also that of mRNA for cyclo-oxygenase 2 (COX-2) , vascular endothelial growth factor (VEGF) , macrophage inflammatory protein 2 (MIP-2) , urokinase-type plasminogen activator (uPAR) , and MKK6 . MK2 is one of the members of the p38 MAPK pathway implied in mRNA stabilization. One mechanism by which MK2 may regulate mRNA stability is through the phosphorylation and inactivation of the zinc finger protein TTP. Binding of TTP to AREs in the 3' untranslated region leads to the rapid degradation of target mRNA. Phosphorylation of TTP by MK2 has been shown to induce the binding of 14-3-3 proteins to TTP, thereby withholding TTP from the mRNA degradation machinery [97, 98]. However, it should be noted that the interaction of 14-3-3 proteins with TTP and its role in mRNA stabilization has been recently questioned . An additional mechanism by which MK2 may regulate mRNA stability may be through the phosphorylation of the heterogeneous nuclear ribonucleoprotein A0 (hnRNP A0), which then binds to the AREs of TNF, COX-2, and MIP-2 mRNA and stabilizes these mRNAs . In T cells, stabilization of cytokine mRNA occurs after the stimulation of the TCR and CD28 . The importance of mRNA stability for the effector functions of T cells has been demonstrated in two different mouse strains in which the Th1 and Th2 bias and the susceptibility to hypersensitivity pneumonitis were correlated with the stability of IL-4 and IL-13 mRNA . We have recently shown that in human memory CD4 T cells, stabilization of IL-4 and IL-13 mRNA by CD28 stimulation is mediated by p38 MAPK . Thus, p38 MAPK is involved in regulating T cell cytokine expression in part by modulating mRNA stability, the precise molecular mechanism of which remains to be characterized. Th1 cells, through the production of IFN-γ, are potent activators of TNF production by macrophages. The pivotal role of TNF in autoimmune diseases is underlined by the success of therapies antagonizing TNF either with mono-clonal antibodies or soluble TNF receptors. Characterizing the signaling pathways that control TNF and IFN-γ expression may therefore be of major interest for the development of low-molecular-mass compounds capable of blocking TNF production that may be orally bioavailable and cheaper to produce than the currently available biologicals . Because of its essential role in TNF and IFN-γ expression by macrophages and T cells, respectively, the p38 MAPK signaling cascade is considered a promising therapeutic target for Th1-mediated inflammatory diseases . Several synthetic p38 MAPK inhibitors have demonstrated protective anti-inflammatory effects in animal models of arthritis, such as collagen-induced arthritis in mice or adjuvant-induced arthritis in Lewis rats [104–110]. However, none of these molecules has yet successfully passed early clinical trials for the treatment of human autoimmune diseases because of safety concerns related to possible cross-reactivities with other kinases. Two different p38 MAPK inhibitors, BIRB-796 and RWJ-67657, have demonstrated clinical efficacy in a human endotoxin challenge model in which the inhibition of p38 MAPK was shown to decrease LPS-induced cytokine and C-reactive protein (CRP) production in vivo and to reduce LPS-induced clinical symptoms, for example those of sepsis (such as increased heart rate, decreased blood pressure, fever, and headache) [111, 112]. Recently, a different p38 MAPK inhibitor, VX-702, was shown to reduce serum C-reactive protein levels in patients with acute coronary syndrome . These data suggest that in humans, p38 MAPK activation is essential in acute inflammatory processes such as sepsis or acute coronary syndrome, but its precise function in chronic inflammatory processes such as those mediating autoimmune diseases remains unclear. In particular, it remains to be defined which stimulus induces TNF expression in autoimmune inflammation and whether p38 MAPK controls TNF production induced by this stimulus. In contrast to Th1-mediated autoimmune disorders, allergic disorders are mediated by Th2 cells through the production of IL-4, IL-5, and IL-13. Because of its central role in Th2 effector functions (Fig. 2), it is reasonable to assume that p38 MAPK may also be important in allergic inflammation. In this regard, it has been shown that in the ovalbumin-induced airway inflammation model, eosinophilia was decreased by inhibition of p38 MAPK in mice and guinea-pigs [114, 115]. Inhibition of p38 MAPK expression with antisense oligo-nucleotides in ovalbumin-challenged mice reduced eosino-philia, pulmonary cell infiltration, mucus production, airway hyperreactivity, and Th2 cytokine levels in bronchoalveolar fluids . Similarly, in ovalbumin-sensitized rats, allergic airway inflammation could be reduced if p38 MAPK was inhibited before allergen challenge . Interestingly, however, inhibition of p38 MAPK did not affect the resolution of the pulmonary edema in previously established inflammation in rats . It is tempting to speculate that this process is independent of T cells. These observations indicate that p38 MAPK is essential for the development of allergic inflammation, probably by controlling Th2 effector functions, and suggest that the p38 MAPK signaling cascade might be an interesting therapeutic target for allergic diseases. Inhibitors of the third generation that are currently in clinical trials will, it is hoped, permit a better characterization of the role of p38 MAPK in humans. However, their use in the clinic warrants further studies to establish and eventually improve their selectivity over the human kinome . Targeting downstream molecules of p38 MAPK or the development of non-ATP-competitive inhibitors of p38 MAPK may be attractive alternative approaches to the therapeutic disruption of p38 MAPK-mediated effects . The characterization of p38 MAPK as a key player in inflammation more than 10 years ago led to the development of several p38 MAPK inhibitors for the treatment of inflammatory autoimmune diseases. Although these inhibitors were potent in animal models of autoimmune diseases and in human acute inflammatory disorders, several clinical trials with p38 MAPK inhibitors have been discontinued because of serious side effects, in particular at the level of the central nervous system. New p38 MAPK inhibitors that are unable to cross the blood-brain barrier are now in clinical trials in rheumatoid arthritis and will delineate precisely the role of p38 MAPK in Th1-driven chronic inflammatory diseases. However, in view of recent advances underlining the essential role of p38 MAPK in IL-10 expression and in Th2 cell functions and of the regulatory capacities of IL-10 and Th2 cells in Th1-driven inflammation, p38 MAPK inhibitors might be associated with some unwanted effects on the immune system, enhancing rather than ameliorating the underlying inflammatory response in Th1-driven diseases. In contrast, these inhibitors may be useful as therapy in Th2-driven inflammatory disorders. However, as p38 MAPK also has essential functions in other organ systems beside the immune system, it may be necessary to characterize precisely the signal cascades downstream of p38 MAPK that control effector functions in the immune system to identify those that are involved in unwanted immune responses without interfering with essential physiologic functions of the p38 MAPK signaling cascade in other organ systems. This might provide therapeutic targets to specifically block, for example, TNF production by macrophages in autoimmune diseases or Th2 effector functions in allergic disorders. The authors thank Professor PE Lipsky for a critical reading of the manuscript and for fruitful discussions. The work was supported in part by the Deutsche Forschungsgemeinschaft (grants Schu 786/2–3 and 2–4) and by the Interdisciplinary Center for Clinical Research (IZKF) at the University hospital of the University of Erlangen-Nuremberg (projects B27 and B3).